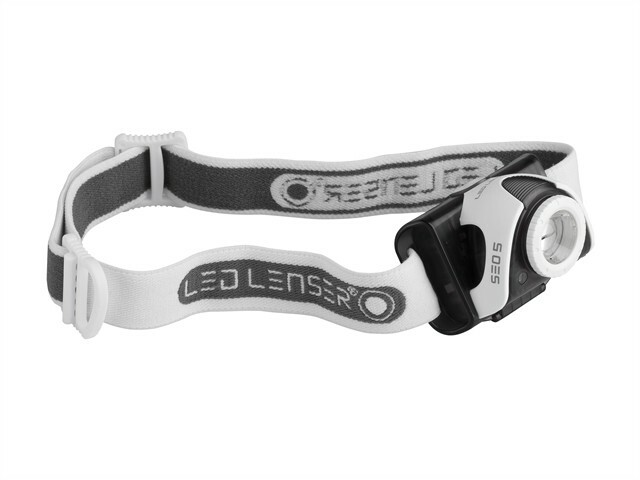 The Ledlenser SEO5 lightweight headlamp with one high end power white LED light and a glare-free red LED light to protect night vision. With Smart Light Technology and Advanced Focus System (AFS). The lamp head swivels 90° for directional lighting. The washable, replaceable, anti-allergic headband is designed for comfort. A transport lock prevents light accidentally switching on, and the casing glows when in use. IPX6 for superior dust and water protection. Belt Hook and Duracell® batteries (3xAAA) supplied. Power: 180/20 lumens. Run Time: 7/25 Hours. Beam Distance: 120/40m. Weight: 105g. 7 Years with registration warranty.